The Dirndl petticoat is back in fashion! No wonder - because the fine undergarment puts your Dirndl beautifully in scene. It makes the skirt swing when walking and especially when dancing and shows that you are are tradition-conscious with taste and style. ... then the wearer could be ready for a little flirt. At least that's what they said in the past. But even today, traditional Bavarians say that the petticoat or the Dirndl petticoat should not peek out under the skirt, and should only be seen in the movement. The fact that the Dirndl petticoat is not a must, already shows that not all Dirndl models are equipped with a firmly sewn petticoat. However, as the fine undergarment has become popular again in recent years, you can also order them separately. The Dirndl underskirt or the Dirndl petticoat offers many advantages: thanks to the fine, smooth fabric, it protects the material of the Dirndl. It gives the skirt a nice shape and makes it swing easily. It keeps you warm on cold days. In addition to the classic white and black Dirndl skirts, colorful models that match the color of the blouse or apron, are currently very popular. Traditionally, the Dirndl petticoat consists of a soft cotton fabric. High-quality models have a detailed hem that is decorated with fine lace motifs. A particularly clever variant of the Dirndl underskirt is the Dirndl petticoat. 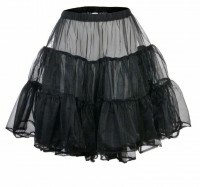 The term "petticoat" is a symbiosis of the French word "petit" (small) and the English "coat". However, the petticoat is not a "small coat", but a puffy underskirt, which is divided into two parts: the upper “saddle” that lays narrow on the hip and the underlying lace and ruffle decorated tiered skirt. The petticoat was already used in the 16th century for the form support of skirts. But above all, it is associated with the wild 1950s and the legendary Rock'n'Roll era. Only with the breakthrough of the super-short miniskirt in the late 1960s the petticoat disappeared from the fashion scene. In Trachten fashion, however, the Dirndl petticoat still plays a leading role and is regarded as a modern variant of the classic petticoat. Can be worn under other skirts. What are you waiting for? Just visit our Trachten online shop and order the Dirndl petticoat of your choice! We’ve got the trendy undergarment in many sizes and colors ready for you. Thanks to the individually adjustable waistband, a good fit is ensured. We are happy to advise you by phone when buying and of course exchange the goods if needed quickly and free of charge. As a service-oriented provider, you can of course also order the right outerwear and Trachten accessories for you and your whole family online.